Drawn to the new orphan boy in town, Tilly Rockford soon became the unfortunate victim of a lot of Orion Dunbar’s mischievous deeds in school. Can Tilly figure out how to truly forgive the one who made her childhood unbearable? Now she doesn’t even know she holds his heart. Can this deviant orphan-train boy turned man make up for the misdeeds of his youth and win Tilly’s heart before another man steals her away? Alice Turner, the owner of one of Charleston’s finest bridal shops, is determined never to be dependent on a man for anything after the disgrace of her father’s prison time. When her best friend requests Alice to be her maid of honor, she reluctantly sets aside her feelings on marriage and dons a stylish bridesmaid’s gown, never intending to catch the eye of the handsome groomsman. 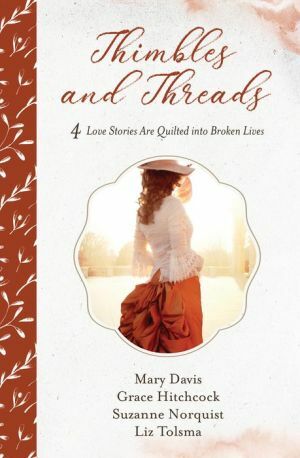 Will he be able to convince her to open her heart again and finish the quilt once intended for her father? Sarah doesn’t need anyone, especially her dead husband’s partner. With four brothers to mentor her boys and income as a seamstress, she seeks a quiet life. If only the Emporium of Fashion would stop stealing her customers and the local hoodlums would leave her sons alone. When she rejects her husband’s share of the mine, his partner Jack seeks to serve her through other means. But will his efforts only push her further away? Melissa Bainbridge is a quirky designer of rag dolls who raises raccoons and never really fit into the small farming town. When Lance Witherspoon arrives in town to thank her for the Sanitary Commission quilt she made that saved his life, she is shocked to learn Lance is a Confederate. Can she and Lance confront the town’s prejudices – along with their own?